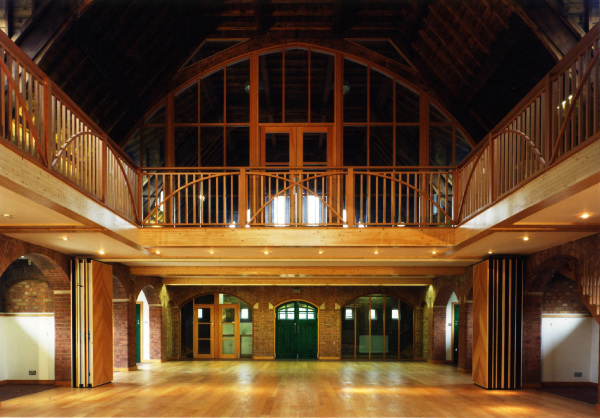 Conversion of a Grade II listed Arts and Craft Hall to accommodate a wide variety of functions that benefit the church and the community. This Grade II listed Arts and Crafts hall was built as the Church of St Faith, early in the C20th. A new church was later built alongside, and the original building became the church hall. By the 1980’s the hall had become rather shabby, and was a greatly underused resource. A mezzanine floor and gallery were inserted into the main hall, with removable acoustic partitions that allowed the space to accommodate a function room, gallery, creche and youth club. A floor was also inserted into the former sanctuary, creating a bar above, and a stage below. The linking block between the hall and the church was altered to form a meeting room and choir vestry above, with priest’s vestry, parish office, and a daycare centre for the elderly below. Elegant insertions were designed to counterpoint the robust interior, and materials were limited to wood, glass and brick to create a warm, friendly interior.